An open air bath facing the rich forests of Tomamu. In the daytime, you can see wide green field. In the night time, beautiful star filled sky is what would delighten your eyes at this refreshing bath. *There is no charge for children preschool age or younger. *Please cover any and all tatoos when enteng the pool or bath. 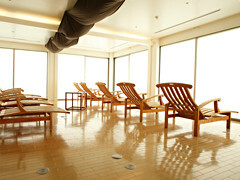 Wide washing area, sauna and a relaxation space is also equipped at the Kirin-no Yu. *No need to bring towels or shampoos, we have them all here. *Body shampoo, Shampoo, Conditioner equipped. *No indoor bath at Kirin-no Yu. *Kirin-no Yu is not a hot spring. At the relaxation room inside the Kirin no Yu, we heat aroma oils that were extracted from the plants and trees of Hokkaido.